How would you like to have me as your newspaper's own, affordable ad sales coach? Every week, I've been walking more than 20 newspapers through the entire sales process for a new high-potential category of prospective advertiser. A new one each week, 52 weeks a year. The service costs very little ($250 per month) and drives sales fast. For example, a weekly newspaper group sold their very first one (for a chiropractor) for over $25,000. 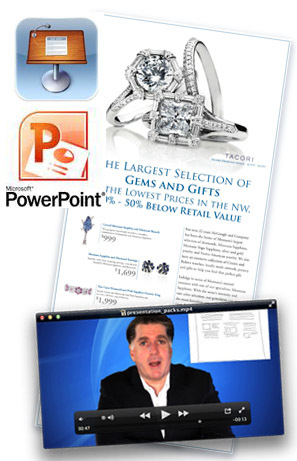 From planning and conducting the first sales call to creating a fantastic ad strategy to exactly what to say and do in the final presentation--including overcoming objections--you get a new series of category-specific videos each week detailing everything you need to make the sale as well as a PowerPoint and Keynote (for the Mac users out there) file and a great ad example. 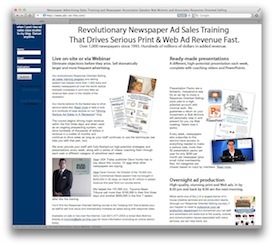 After years of being on the road training and helping sell ads for my client newspapers, I've created this live Webinar and video service, showing you the approach I've been discussing in this blog. A first sales call video where I discuss the key issues unique to that business category, tips on conducting a successful call, what questions to ask and specific answers that need to be secured to ensure a successful ad strategy and sale. A time-lapse video of me taking the information, applying the logic of the Response Model, and sketching out the ad (so you can explain it to the prospective advertiser). A video of me role-playing the final presentation and overcoming the typical objections associated with the business. A video of me role-playing the Web portion of the presentation (if you'd like to add on a Web recommendation). A video of me showing how to walk the prospective advertiser into the concept of using heavy copy ads or product/price ads, when applicable. An example ad or ads as an example (or simply have our design team build it if you're a subscriber to our ad production service). A Response Oriented Selling PowerPoint/Keynote file you can drop your ad into and either print out or present using a laptop or mobile device during your presentation. Contact us for more details at (631) 477-2505 or mcinnis@ads-on-line.com. Download Our FREE E-book: "The 7 Essential Elements Of Successful Ad Sales Training Initiatives"
Visit Our Ad Sales Web Site! Click on the above image to visit our main Web site for more information on our various tools to help drive your newspaper ad revenue fast. Test: Is your local ad staff killing your newspaper (and your advertisers)? Swear they have no money? Think again! Since 1993, I've been a newspaper consultant specializing in advertising sales. Response Oriented Selling is in place at over 1,000 newspapers worldwide. Current clients are driving $100,000+ per month, and I can show you how you can do it as well. I'm also the author of the most popular new hires ad sales courses in North America and run an offshore overnight ad production company serving more than 30 newspapers and newspaper associations. I'm a PAGE-approved vendor for production and ad sales. I'm the former training manger and major accounts supervisor at a top 10 daily. I've also been ad director for a group of 8 and 10 weeklies. I've spoken often at API, INMA, the World Association of Newspapers, the Society of Newspaper Design, and for state and regional associations. I also am a North Fork of Long Island landscape photographer. Contact me at (631) 477-2505. More information can be found at my ad sales Web site.